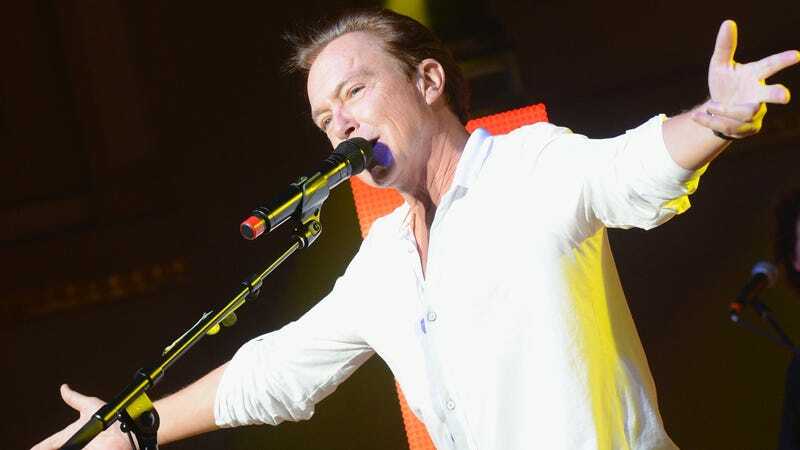 Variety reports that David Cassidy, one of the hugest teen idols of the 1970s, has died after being hospitalized for several days with organ failure. He was 67. Cassidy was the son of Tony-winning actor (and noted Columbo villain) Jack Cassidy and Evelyn Ward. After his parents divorced, his father married Shirley Jones, who would play Cassidy’s mother in his big-break series, The Partridge Family, which debuted in 1970. Although often lumped in with the also-popular-at-the-time Brady Bunch, the series had a much funnier, sardonic edge, mostly attributed to Cassidy playing off of his onscreen siblings like Danny Bonaduce. The series, notably, also featured the family as a singing group, although only Cassidy and his stepmother Jones (a veteran of musicals like Oklahoma and Carousel) actually performed. The Partridge Family made Cassidy a teen sensation nearly overnight, taking over the covers of magazines like 16 and Tiger Beat as the fictional band racked up hit after hit. Bonaduce said that “David Cassidy once had a bigger fan club than Elvis & The Beatles.” At its peak, Cassidymania at one of his concerts resulted in a stampede that killed a 14-year-old girl in 1974, a loss that Cassidy said would haunt him forever. The incident helped him decide to leave The Partridge Family series and group. Cassidy then tried to segue into more dramatic acting. His Emmy-nominated appearance in an episode of Police Story helped lead to a 1978 pilot, David Cassidy: Man Undercover. The series had the same plot as 21 Jump Street several years later, as the baby-faced Cassidy posed as an adult cop going undercover into a high school to try to break up a drug ring. The pilot failed to take off. With not much luck at an onscreen acting career, Cassidy hit the stage, performing in musicals like Joseph And The Amazing Technicolor Dreamcoat and Blood Brothers, co-starring his younger half-brother Shaun, a fellow teen idol who went off to become a successful TV producer. Cassidy also created the Las Vegas shows The Rat Pack Is Back and At The Copa, and was known for opening up his shows to frequent Q&A sessions, answering queries from fans. Cassidy also showed up in various TV guest spots, from The Love Boat to The Ben Stiller Show to Malcolm In The Middle. He starred with half-brother Patrick in 2009’s Ruby And The Rockits, created by Shaun. His most recent TV guest spot was in a 2013 episode of CSI. Ruby and the Rockits - "Pilot"